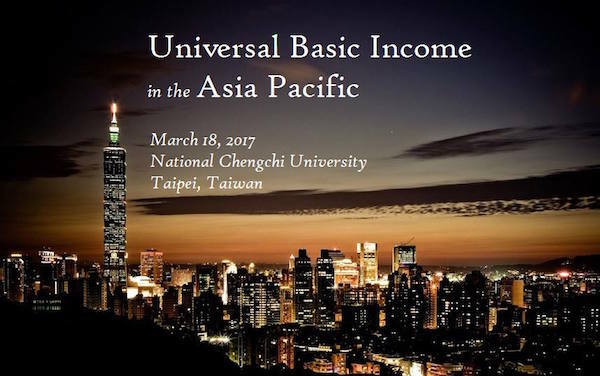 The first basic income conference focused on the Asia Pacific region is being prepared for March 18 in Taipei, Taiwan. Basic Income News features editor Tyler Prochazka is organizing the conference with co-chair, James Davis, student of Columbia University, and activist Ping Xu. Prominent basic income activist Enno Schmidt has confirmed he will attend. Other scholars from China, India, Australia, Japan, New Zealand and the United States are preparing presentations. The conference will be live-streamed on the Basic Income Action Committee’s Facebook page. Davis has interviewed Schmidt and Andy Stern, former president of the Service Employees International Union (SEIU). Davis’ recorded interviews will be screened at the conference. Davis is scheduling additional interviews with other scholars and activists for the screening. Prochazka received an Alumni Development Grant from the U.S. Department of State’s Critical Language Scholarship program to assist in funding the conference. He and Xu are currently seeking funding from other sources to bring more scholars to attend the conference. Xu will also take part in a presentation on March 9 at the Executive Yuan, the executive branch of the Taiwanese government, proposing a basic income trial, and travel around the island after the conference promoting basic income. Tyler Prochazka has written 1 articles.